The past is ever present. Its echo is all around us in the architecture of old buildings — in fine metalwork and ornate facades but also, sometimes, on shrapnel-scarred walls where bullet holes hide beneath a mask of smog and dirt. Those clues wait to be discovered, their stories wait patiently to be told. They are there right now as you read these lines… waiting. I’ve always been drawn to the past. Even as a boy, I used to love watching black and white gangster movies – partly for the plots but also to look at the clothes people wore and hear the way they spoke. I’ve written novels about the past, but in recent years I’ve felt a stronger pull – particularly to my grandfather, Michael Lawlor. His memory has loomed large in my mind for several years. I’d heard snippets of stories about his role during the War of Independence and Civil War, but not much of substance, so I decided to do some digging. I started my research with the national archives, specifically the census figures for 1901 and 1911, and I hit pay dirt. Michael was born on August 8, 1901. According to the 1911 Census, Michael (then aged nine) was one of eight children born to Elizabeth Lawlor (38) and Thomas Lawlor (36). He had seven siblings (the eldest just 13). Thomas and Elizabeth had been married 14 years by then and in that time Elizabeth had given birth to eight children. Two others died before the Census was taken. At the time, the family lived in 11.4 Francis Street (Merchants Quay, Dublin). Thomas Lawlor Snr ran a hairdresser business in The Coombe. The previous Census of 1901 showed the family living in 129.4 Francis Street, with Thomas (25), Elizabeth (28) and sons Thomas (3) and James (1). James was one of the two children not alive when the 1911 Census was taken. After their father died, I knew that Michael had been sent to the Artane Industrial School. So, my next stop was to contact the Dept of Education. I gave them Michael’s details and they said they’d be back in touch. The lady I spoke to also pointed me towards Barnardos children’s charity, which also kept records of those who’d spent time in the industrial schools. A few weeks later, I got a result –Barnardos had a record of Michael’s time at Artane. It turned out that a Judge MacInerney had ordered that Michael be detained there on July 24, 1913, for “wandering and not having any visible means of subsistence”. There was no record of his years within the school, but there was other information. Once he’d left, according to the industrial school register, he followed his father’s trade and apprenticed as a hairdresser. The register noted on August 16, 1917, that he “likes his place well”. On December 9, 1920, it recorded that he was “working as a journeyman”. The date is intriguing because Michael was certainly doing more than journeyman work at that time; he was also a soldier in the IRA, engaged in intelligence work – spying against the British army – for E Company, 1st Battalion, of the Dublin Brigade during the War of Independence. That information came courtesy of Michael’s military pension application form, which was supplied to my father as far back as 2004 by the Department of Defence. Every former soldier from those times would have filled in this form, detailing their service history to obtain a pension. Michael was imprisoned in Arbour Hill for five weeks at some stage between 1919 and 1921 (possibly for the action mentioned above). Not mentioned, though, is what he told my father — that he was interrogated and tortured, even having a fingernail pulled out. A little online research soon showed that the man Michael spied on was Major Geoffrey Lee Compton-Smith (2nd Welch Fusiliers). The hotel referred to was located at 15, Trinity Street. Compton-Smith was abducted on April 16, 1921, in Blarney. He was later found with a bullet in his forehead, wearing plus-fours and in his stocking feet. He was a hero from the war – wounded twice, mentioned in dispatches six times, and won the Distinguished Service Order and the Legion of Honour. Of course, Michael knew none of that. Nor, I suspect, did he know that moments before he was killed, the Major wrote a poignant letter of farewell to his wife and daughter, and even managed to bequeath his watch to the IRA officer who was about to execute him. It was rewarding to find such information and being able to link it to my grandfather. It somehow made his military service more real. Reading those words made me so proud of Michael. Stealing information from under the noses of notorious Black and Tan officers in the very room where they felt safest, and in the most guarded building in Ireland… that took some guts. His darkest time, though, came when he formed part of a firing squad to execute none other than Erskine Childers (author, Irish patriot, gun-runner and director of propaganda for the anti-treaty side). As he stood there, facing all those rifle barrels, Childers spoke to Michael and the other men about to kill him. I mentioned this fact on my blog (historywithatwist.wordpress.com) and was contacted by a man, who had done much research on the subject. His father had also formed part of that firing squad. 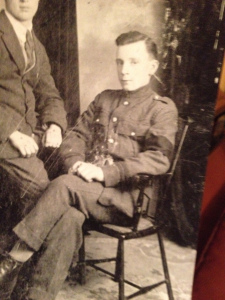 He showed me photocopies of army registers for the Dublin Guard with his father’s name and, just a few lines below, that of my own grandfather Michael. He asked what rank Michael was. I told him Sergeant Major. He seemed satisfied with this (only NCOs formed the firing party). He then asked if Michael had ever served in the British Army. I said no. I was then informed that the practice at the time was to give live rounds to those men who had once been British soldiers and to give blanks to those who hadn’t. So, maybe Michael didn’t kill Childers with his bullet. My grandfather was prone to epilepsy – said to be due to beatings he received during his military service. He died on Christmas Day, 1953, aged just 52. His story is like that of many young men of his generation, who risked all in the name of freedom. Were it not for the bureaucracy of pension and census forms, though, much of his story would have remained untold. It is the way with most families that there is usually one member who will gather together some of the ancestral history in the hope of passing it on to future generations. The problem with most of these documents is that they can be quite uninspiring. Usually, the person who has gone in search of them is the only one interested in wading through their dense prose. It was for this very reason that I decided to knit all the knowledge on Michael together and to present it in more readable and accessible format for the rest of the family. 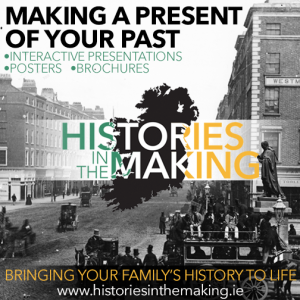 The result was an illustrated 12-page brochure and digital file which put all the information we had on Michael in its historical context, fleshed out and made more real and relevant for those reading it. Now we all have his story – or some of it at least – to read and pass on to our own children. I enjoyed the process, so much so that I set up Histories In The Making. I want to put these scraps of information together for other families so that they, too, can have a readable, accessible record of their loved ones’ lives. The ghosts of the past still linger, their barely-heard echo masked amongst the sounds of rush-hour traffic and smothered by our own rush-hour lives. We should heed that ghostly call and seek out those clues to our ancestors before they are lost forever. Talk to elderly relatives, dig out those dusty documents, pick up the scattered pieces of information and then, maybe, give them to me and together let us create a present of the past for your family’s future generations.